Villas at Island Club is a tropical resort just minutes from your favorite theme parks yet still secluded enough to provide a quiet and relaxing break during your stay. The 220 units share a pair of swimming pools and a clubhouse complete with a fitness center and video game arcade. 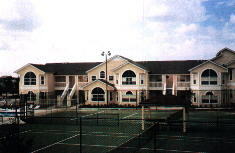 The main clubhouse also is adjacent to a tennis court, shuffleboard, volleyball court, and sandy playground and picnic area. Yes, it's all free while you are a guest at Villas at Island Club. Free local AND long distance telephone calls!